Since its formation in January 2013, the University of Michigan Living Building Challenge Team’s objective is to provide retrofit designs for local buildings to help them become self-sustaining structures as characterized by the Living Building Challenge. With our water infrastructure near the end of its service life and buildings amongst our greatest energy expenditures, we focus on adjusting existing structures to meet the coming century’s needs. Our current project is the retrofit of a typical Washtenaw county home with on-site rainwater purification and wastewater management within the home’s net-zero energy budget. The team is working with the Grocoff family at their historic net-zero energy house to realize this project and provide a platform for community collaboration and education in the process. The U-M Living Building Challenge team consists of graduate and undergraduate university students, local professionals and community members and is based in Ann Arbor, MI. The U-M LBC team is housed within BLUElab, the sustainable engineering organization at the University of Michigan. 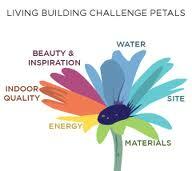 The guidelines on living building design utilized by the team are developed by the International Living Future Institute. To learn more about these green building standards, see the ILFI website.